How can Jio Institute which does not exist be selected as 'Institution of Eminence'? Govt explains! The Ministry of Human Resource Development today came out with an explanation on how Jio Institute was accorded such coveted status despite having no physical infrastructure in place. 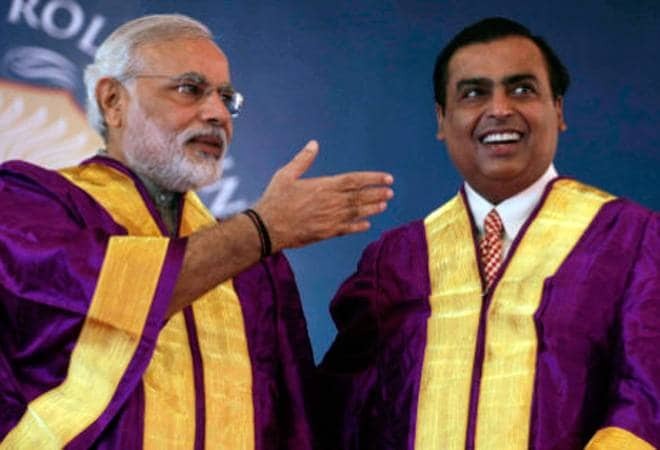 Reliance Foundation's Jio Institute is among the six colleges that have been selected as Institutions of Eminence - a status that will ensure complete autonomy and facilitate them to make a mark in global rankings. Apart from Jio - which is yet to established, other five institutions are Indian Institute of Science- Bangalore, IIT-Bombay, IIT-Delhi, Birla Institute of Technology and Sciences (known as BITS-Pilani) and Manipal Academy of Higher Education. All these institutions are running and running well. But, why Jio Institute, which does not even exist, in the list? This is the question that many people and academicians are asking ever since the government announced its decision. A professor from IISc-Bangalore in a tweet asked, "How did @PrakashJavdekar evaluate this Jio Institute to decide it was better than IIT M or IIT KGP or so many other Institutions? How can an Institution that is in the process of being set up be declared Institution of Eminence? What are we missing here?" The professor echoed the sentiments of lakhs of people who are expressing their anger over the decision on the micro blogging site. Sensing the anger, the Ministry of Human Resource Development today came out with an explanation on how Jio Institute was accorded such coveted status despite having no physical infrastructure in place. According to the government, Jio Institute has been given this tag under Greenfield Project - purpose of which is to allow responsible private investment to build global class educational infrastructure. There were four parameters on which all applications were judged. The parameters were: (a) availability of land for construction of the institution, (b) putting in place a core team with very high qualification and wide experience, (c)making available funding for setting up the institution and (d) a strategic vision plan with clear annual milestone and action plan. "The Committee (selection committee) has come to a conclusion that out of the 11 applications, only Jio Institute satisfied all the four parameters, and hence was recommended for issuing a letter of intent for setting up an Institute of Eminence," the HRD Ministry said. The Ministry also clarified that the private institutions under the project will not get funding from the government. This is significant as public institution selected under IoEs will get financial assistance up to Rs 1000 crore over the period of five years. The Ministry had received 114 applications - 74 from public sector and 40 from private sector - for selection of IoEs. The government expects that the selected Institutions will come up in top 500 of the world ranking in 10 years and in top 100 of the world ranking eventually overtime - so far, no Indian university have figured in the top 100 best universities in the World University Ranking. Finance Minister Arun Jaitley in his budget speech 2016 had announced that the government was committed to empower higher educational institutions to help them become world class teaching and research institutions. "An enabling regulatory architecture will be provided to ten public and ten private institutions to emerge as world-class Teaching and Research Institutions. This will enhance affordable access to high quality education for ordinary Indians," he had said. Ministry of Human Resource Development in a statement issued on Monday said that to achieve the top world ranking, these selected Institutions will have autonomy to admit foreign students up to 30 per cent of admitted students and to recruit foreign faculty upto 25 per cent of faculty strength. These institutions can offer online courses upto 20 per cent of its programmes and enter into academic collaboration with top 500 in the world ranking Institutions without permission of UGC. Not only that, these institutions are free to fix and charge fees from foreign students without restriction. The government had initially planned to upgrade 20 institutions - 10 from public sector and 10 from private sector - as world class teaching and research institutions called as Institutions of Eminence. However, an empowered expert committee headed by former chief election commissioner N Gopalaswami recommended selection of only six institutions.